An American finalist is assured in both the girls and boys singles draw after quarterfinal play in the ITF Grade 1 International Hard Court Championships Thursday, with No. 12 seed Gianni Ross and No. 16 seed Oliver Crawford playing for a place in the boys final and No. 2 seed Claire Liu and unseeded Hailey Baptiste facing off in Friday's semifinals. Crawford defeated No. 10 seed Yshai Oliel of Israel 7-6(5), 6-4 to reach his third Grade 1 semifinal of the year, while Easter Bowl champion Ross picked up one of his best junior victories, beating No. 1 seed and ITF No. 10 Genaro Olivieri of Argentina 7-6(2), 6-4. Ross had to make an adjustment in the first set, after Olivieri's game style and favored side didn't fit with his expectations. "I was a little surprised on the way he played at the start of the match," Ross said. "I thought he was more of a clay court-esque type of player. But he was hitting through the court, and I was like, what? I had to adjust real quick, because my game plan was opposite of what I ended up playing. I played more to his forehand than backhand, because his backhand was cash money early, so it was a weird start." Olivieri broke Ross for the third time in the opening set to go up 5-4, but he never got to set point, with a forehand from Ross forcing an error at 30-40. "I actually served bad," Ross said. "I missed a lot of first serves and at times gave up mentally on first serves. I should have focused really hard and just make sure I was getting first serves, hit big to his forehand, but it was like zero percent first serves. If I had the stats, I could tell you, but it was probably below fifty for sure." Ross's serving improved in the tiebreaker, which he ended from 5-2 up with a second serve ace and an ace. "It was a really, really tough first set," Ross said of the 75 minutes he needed to secure it. "It wasn't slow tennis, it was like, boom, boom, boom, boom. But neither of us is the type who is going to bail out on a point because we can just step up and hit an ace on the next point. We've got to make sure every point counts." The second set differed from the first only in the number of breaks, with Ross getting the only one at 3-3, with Olivieri donating several points with unforced errors. 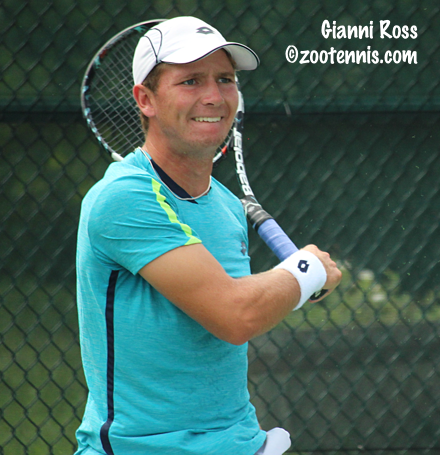 Serving at 4-3, Ross needed two deuces and four game points to finally hold, but he served out the win when Olivieri netted a backhand on the second match point. Ross could not remember the last time he and Crawford played, although he did win the third place match they played in the Kalamazoo 16s back in 2014. "We have similar games, and it's going to be fun," said Ross, a 17-year-old from Illinois, who now lives and trains in Boca Raton, Florida. "We're pretty good friends too. I just want to go out and play my best, and hopefully he does the same." The other semifinal will feature a clash of doubles partners, with No. 3 seed Youssef Hossam of Egypt playing No. 2 seed Miomir Kecmanovic of Serbia. Hossam outlasted No. 7 seed Sam Riffice 6-4, 6-7(3), 6-3 and Kecmanovic defeated No. 9 seed Khumoyun Sultonov of Uzbekistan 6-2, 6-1. The match will be their first meeting on the ITF junior circuit. The No. 1 seed in the girls draw has been rounding into form after two tight first round matches, and in Thursday's quarterfinal, Anastasia Potapova of Russia defeated No. 10 seed Caty McNally 6-4, 6-1 to extend her ITF junior winning streak to 16. The Wimbledon girls champion will face fellow 15-year-old Xiyu Wang of China, after the No. 7 seed defeated No. 4 seed Maria Mateas 6-4, 6-1. Fourteen-year-old Hailey Baptiste won her first ITF Grade 1 match on Monday and her total is now four after beating reigning USTA 16s champion Nicole Mossmer 3-6, 6-4, 6-1. She will play No. 2 seed Claire Liu, who has lost just ten games in four matches this week, and reached the semifinals with a 6-1, 6-0 win over unseeded Alana Smith. "I was trying to be aggressive and to pressure her," said the 16-year-old from California, whose familiarity with Smith's game was formed just this week. "One thing, later in the match, that I was focusing on, was trying to move the ball. I didn't want her in one corner, I wanted to keep her moving and I think that gave me a lot of short balls and let me come into the net." Last year at this time, Liu was preparing for her final round qualifying match at the US Open, but although she said she'd rather be at the US Open, "results-wise, I don't think I'm doing that well and I totally agree with the wild cards they gave out. I'm not mad about that or anything." 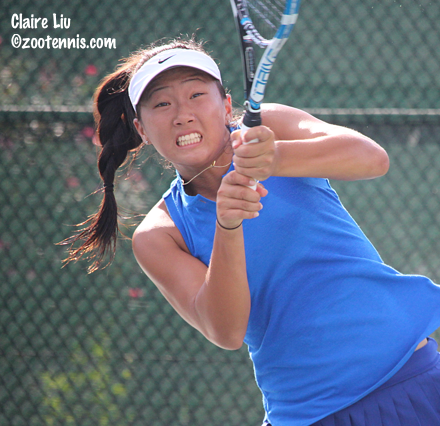 Liu, who lost in the second round (as a seed, it was her first match) at the USTA Nationals in San Diego, sees this tournament as better preparation for the US Open Junior Championships in ten days. "It's good for me to play this and start winning some matches to get my confidence up for the US Open," said Liu. Liu is looking forward to playing Baptiste, who, like Liu, is more comfortable at the net than most juniors. "She hits the ball big, has a big forehand, and she has really good hands," said Liu, who had the opportunity to play Baptiste in doubles Thursday afternoon. "She's really good." 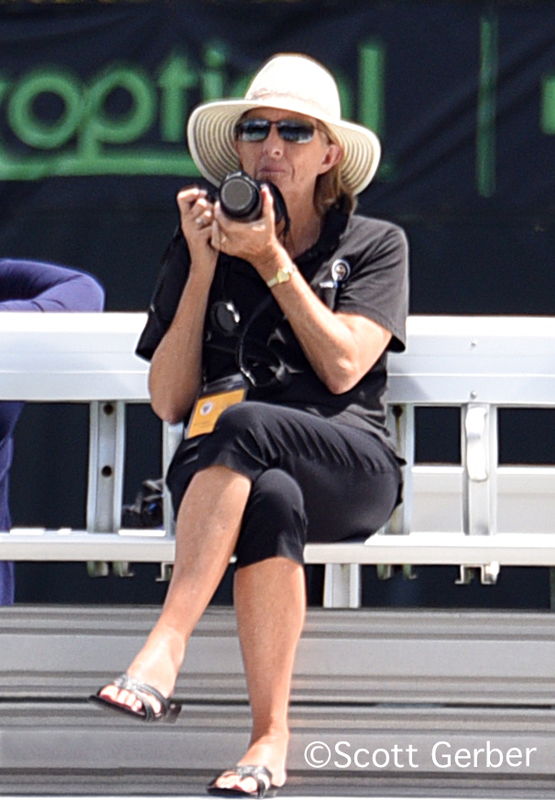 Baptiste, who trains at the Junior Tennis Champions Center, will have her share of fans on the porch veranda that overlooks the show court, but Liu is not worried about that. "I like playing with the crowd against me," said Liu, who has been playing internationally for more than three years. "It gets me pumped up. It'll be fun, for sure." The doubles semifinals are set, with one seeded team remaining in the boys draw and two seeded girls teams left. Liu and partner Sofia Sewing, who are unseeded, will face No. 4 seeds McNally and Natasha Subhash. Unseeded Victoria Flores and Kate Paulus play No. 8 seed Morgan Coppoc and Victoria Emma in the other semifinal. Crawford and Patrick Kypson are the only boys seeds left, with the No. 7 seeds taking on Danny Thomas and William Woodall, who beat No. 1 seeds Hossam and Kecmanovic 6-1, 6-3 in this afternoon's quarterfinals. Sebastian Korda and Nicolas Mejia of Colombia will face Yshai Oliel of Israel and JTCC student Andrew Fenty in the other semifinal. For complete results and Friday's order of play, see the tournament webpage. Rain has disrupted the second round of qualifying at the US Open today, but Alexander Sarkissian and Ryan Harrison have moved into the final round of qualifying with wins earlier today. Sarkissian beat Quentin Halys of France 7-6(5), 6-2 and Harrison defeated Joris De Loore of Belgium 7-6(5), 6-4. Christian Harrison, Noah Rubin, Jared Donaldson, Reilly Opelka and Sekou Bangoura are either still on court or yet to begin. 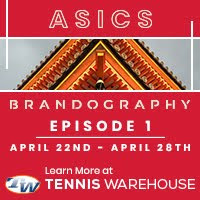 CiCi Bellis, Kristie Ahn, Asia Muhammad, Jessica Pegula and Taylor Townsend are now just one win away from the main draw, with Usue Arconada and Melanie Oudin interrupted in their second round matches and Jennifer Brady just getting underway as of 7 p.m.
Bellis defeated Grace Min 6-4, 6-0, Ahn took out No. 5 seed Kai-Lin Zhang of China 1-6, 6-4, 6-3, Muhammad beat Cindy Burger of the Netherlands 6-2, 6-2, Pegula downed An-Sophie Mestach of Belgium 6-4 6-3 and Townsend cruised past Olga Savchuk of Ukraine 6-0, 6-2. For results and Friday's order of play, see the US Open website.